I am still reading the Hunger Game series, mostly because I keep getting spurred on by my students, who are devouring the series. Catching Fire is the second book. 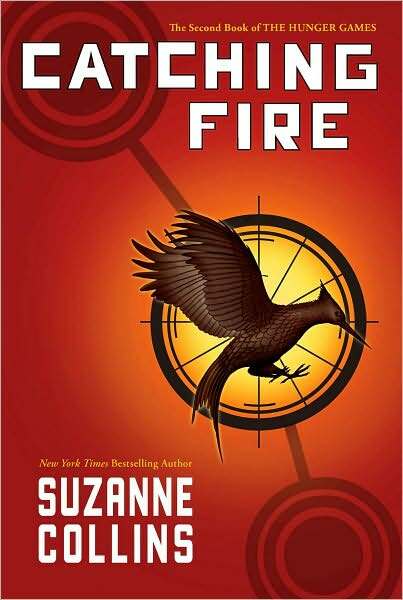 It didn’t quite hold me as much as the first one, but I am reminded of what I liked about the book and didn’t quite so much like about the movie: the inner voice of Katniss. That first person narrative voice is the most powerful element of the series, in my mind, and the writing in the present tense brings her fears and concerns right to the surface of every chapters. That keeps me hooked. Here, Katniss is becoming the spark of a rebellion, and then is sent back into the games for a second time. There’s a bit more political intrigue going on, but this book feels like a second of a series of three — sort of like a placekeeper for the larger story unfolding in the dystopian world. I will be heading into Mockingjay soon, if only to say to my students: I read it. I mean, I like the books fair enough, but I see some other books in my stack I’d like to get to, too. On a related note, there has been a flurry of editorials and letters to the editor in our local newspaper about The Hunger Games series. It began with a regular columnist, whose area of expertise for the paper has been bullying, and she came out pretty strongly against the book and movie. She cited its violence and glorification of killing. She said it has no place in the hands of young people, particularly younger children. Then, she admitted that she had not read the book. Well … don’t shout out about a book that you haven’t read, for god’s sake. Her editorial was quickly followed up by a stinging response that called her on the carpet for trying to cast judgments on a book that she has never even read. (Round of applause.) This writer acknowledged the violent theme, but noted that Katniss and others were trying to avoid the games and when forced to participate, mostly regretted the decisions. The writer also noted the political angle, and the Greek mythology that runs through the books. Finally, this response noted that the books are for Young Adults, or teenagers, not little children. The YA label is there for a reason. We both looked at this seven year old and then at each other, shocked. Until another first grader wandered up. Yikes. The parent in both of us cringed. And I was reminded of that when I read the teacher’s editorial about exposure to violence in literature and pop culture. I don’t have the solution to fix the world, except to note that MY first grade son won’t be anywhere near The Hunger Games books or movies for quite a few years. Although they are quite different tales, we at my school all had the same opinions when the Twilight series popped up a few years ago. My older students loved it, & last year they devoured the Hunger Games books, but so did much younger students, although not in the classes. We find that some parents think it’s great that their children seem so mature, therefore can read more mature books. It’s difficult to sway them into assessing the possible reality of what your quote termed ‘psychic numbing’. Plus, the children are missing such wonderful books by thinking they are too easy! Thanks Kevin. Wow, first graders seeing the movie?? I anguished about doing a book club with my 8th graders and taking them to the movie for a compare and contrast. Will be interested to hear how you like the final book, and I can’t comment more until you read it, then the discussion is on!! What I do know is this series has students coming in my room from all over campus checking out books even as school is winding down, and after my week of feeling like what we do doesn’t impact, that too reminds me that we do. I am about two-thirds of the way through the last book right now … like it better than the second one. What I really like about the series is that you can’t really read it just for entertainment, it’s going to cause an internal dialog and even better if parents and educators bring the dialog out into the open. I think we often underestimate children’s ability to make connections from this book to our current reality and their desire to actually see an end to violence.